Togue Brawn can be described as Maine’s scallop lady. 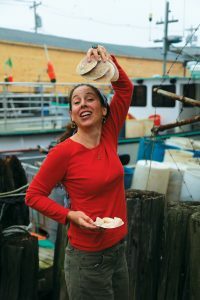 “I guess I’m best known for two things: spear-heading the effort to make Maine’s scallop fishery more sustainable and being an advocate for Maine’s scallop fishery and its product,” she says. Even though the state’s season doesn’t open until the snow flies in December, scallops are never far from Brawn’s mind. She owns Downeast Dayboat/Maine Dayboat Scallops, a company she started in 2011 in Hancock, Maine. Working closely with local fishermen who harvest scallops from Maine’s ocean floor is the centerpiece of Brawn’s work. She buys the sweet creatures directly off boats and then rapidly delivers (or ships) them to restaurants and markets around the country. 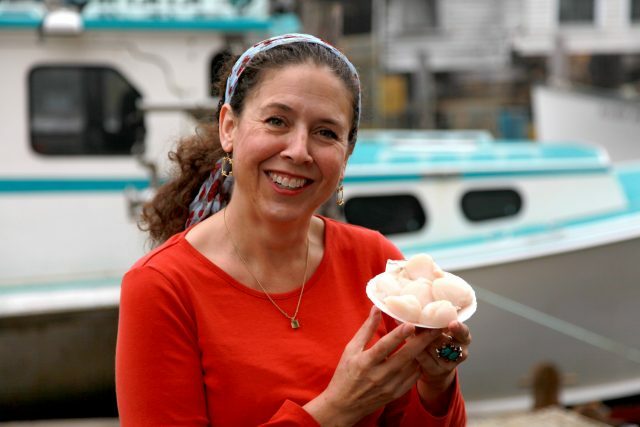 The company is based “wherever the scallops are coming in,” she says. The flexibility to process and ship from locations in Pembroke, Hancock, Richmond or Cape Elizabeth is one part of Brawn’s business model that runs counter to the commodity scallop market, where scallops are stored for longer periods of time and soaked in freshwater. Her expeditious turn-around appeals to chefs and consumers who embrace a fishery-to-fork ethos, which includes knowing where your fish came from and who caught it. Unsurprisingly, Brawn’s roots in Maine’s commercial fishing industry run deep. She grew up in Cape Elizabeth and her father is a lobsterman, “so I went out on his boat as a little kid,” she says. When she was 14, she got her very first job at Cape Fish and Farm Market in Cape Elizabeth (it’s no longer there). Her first job on the Portland waterfront was at Harbor Fish Market in 1988. “I loved it,” she says. She studied geology at Duke University (1992) and earned a graduate degree in marine policy in 2002 from the University of Maine. Then she ventured into fisheries research and policy at the Maine Department of Marine Resources, where she worked until 2011. And, perhaps you’ve seen Brawn at J’s Oyster in Portland, where she has waitressed in some capacity for 20 years. Ultra-pricey “diver scallops” found on many menus around the country are actually mislabeled and are harvested by off shore boats, she says, not hand-picked from the ocean floor by scuba divers, as the label suggests. “True diver scallops are indeed exceptional,” says Brawn. But less than 10 percent of Maine sea scallops are harvested this way. Instead, Downeast Dayboats works with fisherman who use modern scallop drags designed to minimize contact with the sea bottom. They harvest only 10 to 15 gallons at a time, remaining within three hours from shore, “so they go out and come right back,” she says. The scallops are fresher when shipped and aren’t water-logged from days on an off shore boat. 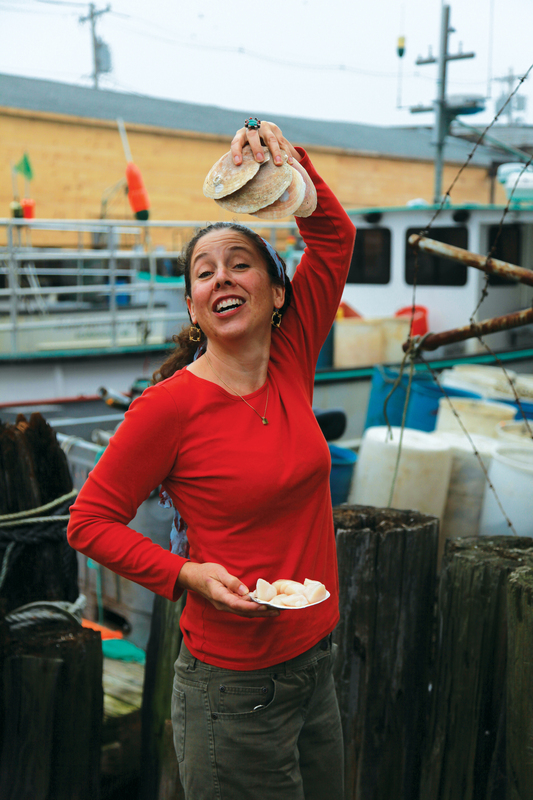 If she gets it her way, all Maine scallops will get recognition for their superior flavor and story—and she has dedicated her life to improving the fishery’s sustainability and profitability. “Fighting for fisheries justice is what energizes me,” she says. Caroline Losneck is a Maine-based documentarian, radio producer, and experimental installation artist. Her work is featured on Maine Public Radio, NPR, Marketplace and WMPG Community Radio. 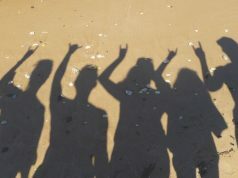 Her documentary film work has appeared in The New York Times and at film festivals around the country.